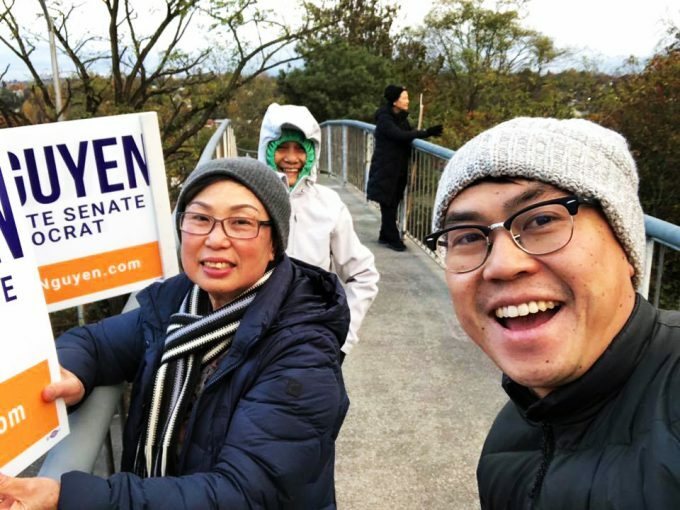 Vietnamese Americans make history in Olympia in both House and Senate. For 43 years young Vietnamese American community of Washington, November 6, 2018 marks a historical event: for the first time in Washington State, 2 Vietnamese Americans got voted into the highest political offices. Joe Nguyen, from Legislative District 34, ran a courageous campaign against a Democrat insider Shannon Braddock, in a race to the Senate for an open seat. Nguyen won a hard-earned victory with 30,199 votes (57.42%) – Nov 8 numbers. 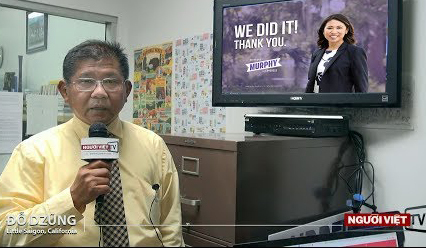 In an interview with Mr. Nguyen post election night, we learned he had worked tremendously hard on this campaign to rally over 200 volunteers, strategically designed mailers to fit various targeted demographic groups in his district, utilized digital media, and inspired his base to rally for him. 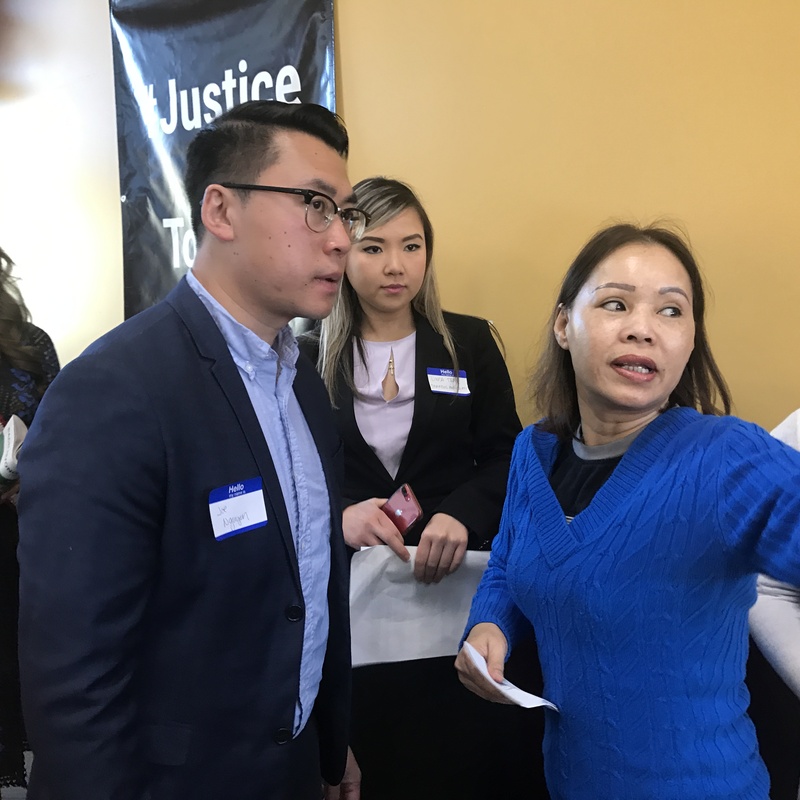 Joe Nguyen is the first legislator of color in this Legislative District, and will be the first State Senator of Vietnamese American descent in Washington. 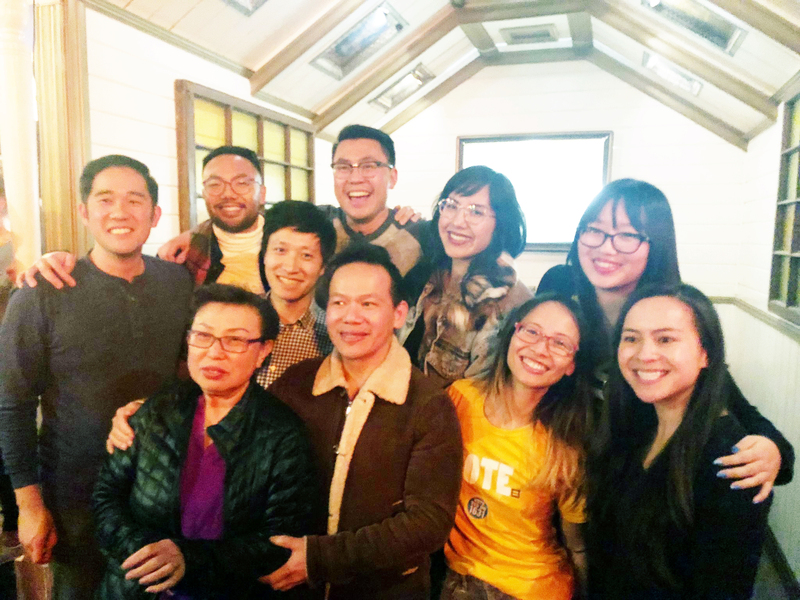 Joe Nguyen (center) and his supporters Brian Do, Michelle Le, Joe Nguyen, the author Monique Le, Loan Vo (Kieu) at Diamond Hall in Southwest Seattle, where a celebratory party will be held early December 2018 for both election winners. In the end, his opponent Shannon Braddock, a formidable and connected executive for King County Executive Dow Constantine, who received major financial props from different PACs, who also lead a strong campaign, lost to Joe Nguyen – son of immigrants, who started out from the bottom being a janitor to put himself through school, who had earned and learned his way to an influential position in the Senate representing the people of West Seattle by working incredibly hard as he has always done all through his life. 1. True to his immigrant root, Joe worked harder, campaigned all the way until the last minute to secure the Senate seat despite knowing his lead. 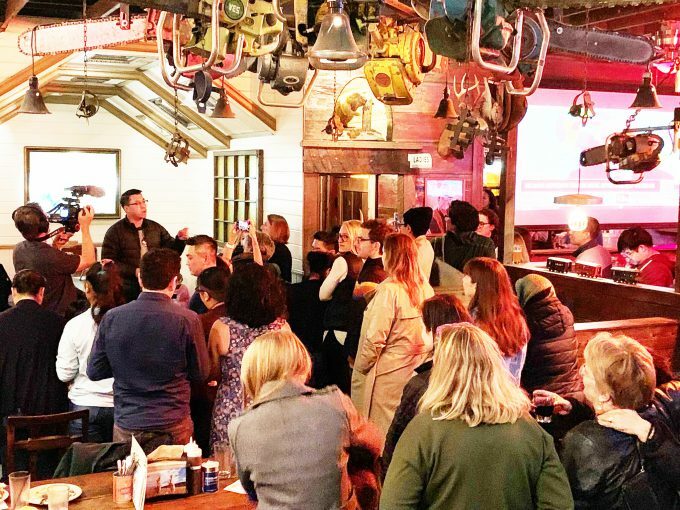 Joe shared: during the weeks leading to the final count down, he worked round the clock campaigning after his job as a manager at Microsoft, walking his district so much he developed tendonitis. 2. Not content with the status quo, Joe appealed to his home base in West Seattle by knocking on doors to talk with neighbors about his representation. He and his supporters greeted 25,000 voters in his district at their door to bring his message to the Senate. 3. With a modest $90,000 grass root campaign raised with no major PAC money, approximately 1/3 of his opponent, Joe turned his underdog position upside down, using sweat equity to build trust among his supporters and allies to advance. 4. Strong digital media game combined with strategic advisors and organizers at the core, Joe clearly demonstrated his ability to not only work hard, but smart. 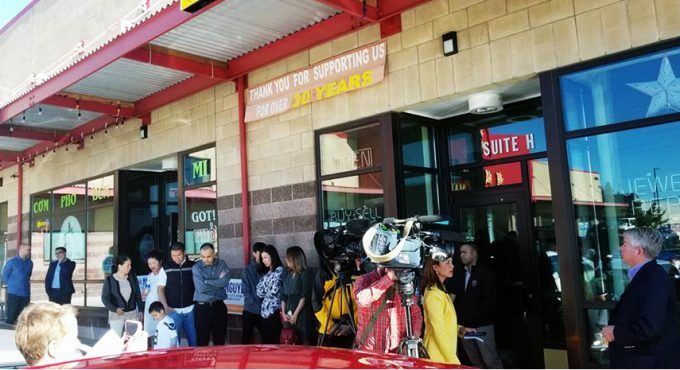 By being true to his values, by following through with promises, by meeting challenges and beating the odds, by the content of his character, Joe Nguyen had earned the trust and confidence of the 34th Legislative District residents and a seat in the Senate. We can’t wait to see what he will do next. 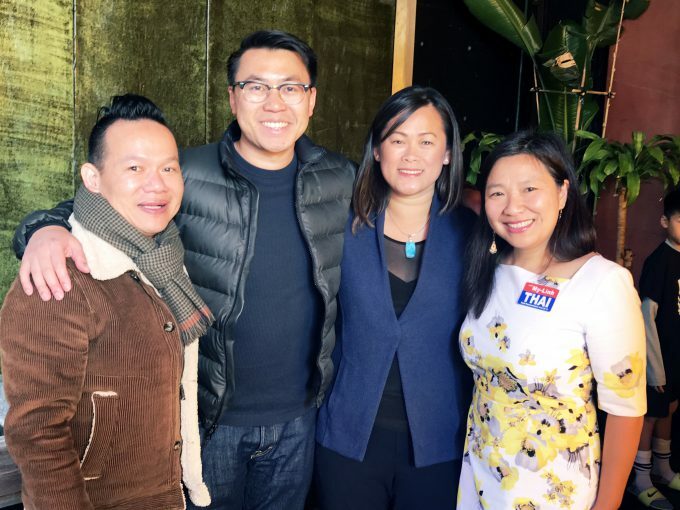 My-Linh Thai, current Bellevue School District Board President, also scored big in her race to take Legislative District 41 – State Representative Position 2. Thai won the position with 35,086 votes (65.43%) as of Nov 8th drop. My-Linh numbers are surprisingly strong when we consider her other State Representative Position 1, encumbent Tana Senn also scored similar number of votes with similar percentage. 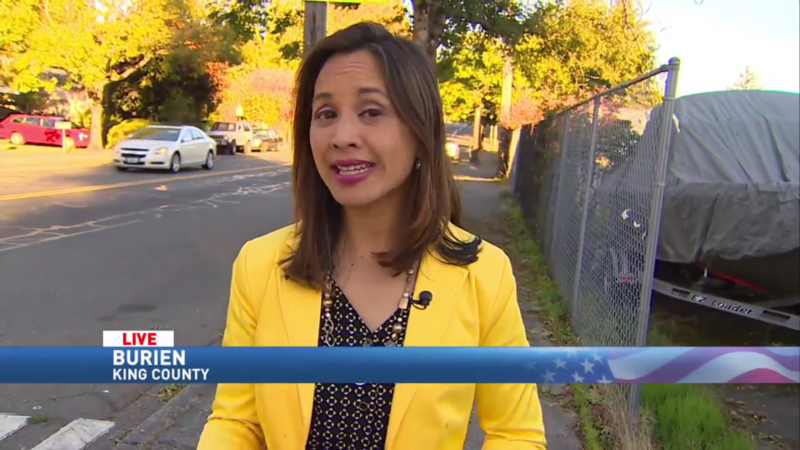 When asked what she thought may have attributed to her strong numbers for a first timer, and those that are similar to a much more established House Member such as Tana Senn, My-Linh attributed it to the characteristics of her 41 District as a well-informed community, her service on the Bellevue School District Board history, and the recognition of her name as Bellevue School Board President. It was also helpful to have past and current leadership endorsements, including House Rep. Tana Senn herself, Adam Smith, Cyrus Habib, Bob Ferguson, Judy Clibborn, Marcie Maxwell and many other influential policy makers; major support from the Seattle Times, the Strangers, the 41st Legislative District Democrats, long-term supporters such as APACE (Asian Pacific Islander Americans for Civic Empowerment), OneAmerica Vote, WA Labor Council…etc, are among numerous endorsements that she received. 1. Public Education – Something she has always been passionate about as her Bellevue School Board service attests. She wants children to have access to opportunities to prepare themselves as “Global Citizens”. 2. Public Healthcare – “cornerstone of Democracy” My-Linh champions Public Health to be a right, not just a privilege. She wants to see services provided to the public to include preventative measures and educating patients about the importance of self-care through diet, exercise and taking medication. 3. Climate Change – My-Linh wants to preserve the quality of our water and air for future generations. To leave the earth a better place than we find it. She believes it is critical to have the courage to stand up and be vocal about protecting the environment. As a side but also important note, My-Linh feels strongly about the message of inclusiveness to immigrant children whose parents are under threat of deportation, which was what motivated her to run for office. She believes her win is for the refugees and immigrants community, the underprivileged and underserved. My-Linh Thai shared she is excited to join the House of Representatives and be briefed on issues as well as open to the Caucus’ input. With My-Linh Thai addition to the House, and Joe Nguyen to the Senate, both of Vietnamese American immigrant/refugee roots – such unique backgrounds are likely to bring diversity, fresh perspectives, and invaluable experience to the Legislature. 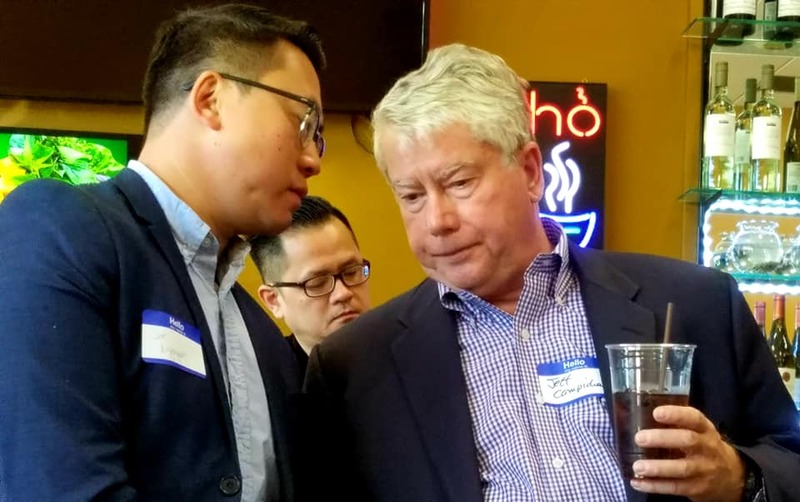 The Vietnamese Americans community has reached an important landmark with these two (2) elected officials, joining the ranks of other older and more established communities in Washington State. Ông Joe Nguyễn, vừa đắc cử Thượng Viện Washington. Dược Sĩ Thái Mỹ Linh, vừa đắc cử Hạ Viện Washington. Theo trang web tranh cử của mình, ông Joe Nguyễn cho biết ông ra đời ở White Center, lớn lên ở Burien, có cha mẹ là người tị nạn Việt Nam, và từng cám ơn những giúp đỡ của chính phủ bước đầu qua trợ cấp xã hội. Cha ông một chiến sĩ Giang Đoàn Hải Quân, qua đời vì tai nạn lao động bị bại liệt tay chân, lúc ông mới 7 tuổi. Dóng góp nổi bật của ông tạo sức hút nổi bật trong cộng đồng người gốc Việt xa gần, là mạnh mẽ bênh vực cho Tommy Lê, người học sinh bị tử vong oan uổng ngay từ tháng 7-2017. French Producer Jean Pierre Barry (1947-2018) Người chắp cánh cho sinh hoạt văn nghệ của người Việt tị nạn..